EmperorS4 is one of my hidden publishing gems – while they have become very familiar to me and my game group, I think that the company is a bit of an unknown in mainstream gaming circles. Their recent resume of games has been filled with hits for me: Round House, Hanamikoji, and Burano to name a few. They have had an increasingly larger presence at the SPIEL fair in Essen, and I hope that they get more exposure in the years to come. Given the previous track record, I’m always excited to hear that I’m getting a new EmperorS4 game in my boxes from Taiwan. 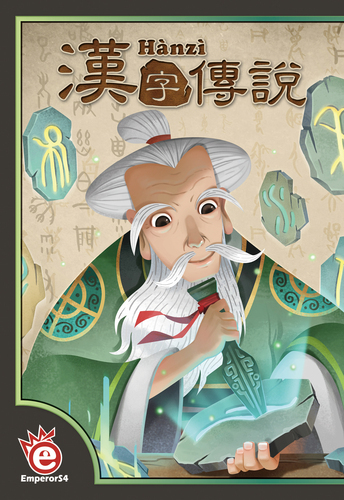 Hanzi is a game that tells the story of Cang Jie, the legendary creator of Chinese written language. 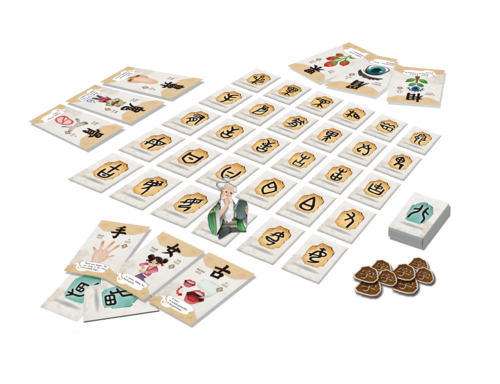 In the game, players work to create the ideograms that will become the basis of the new language. 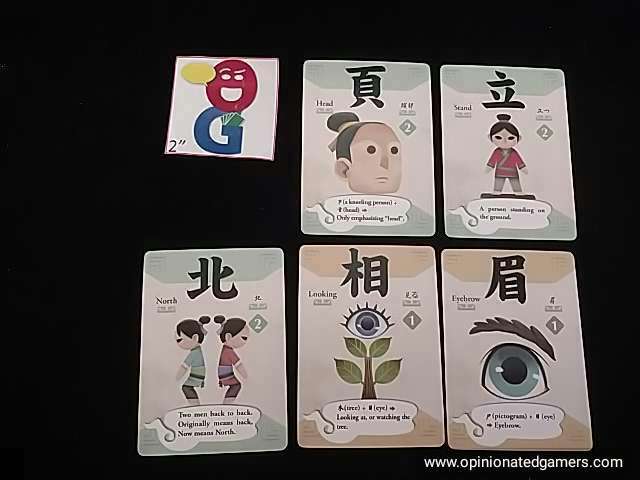 The game is separated into two ages, and each age has a deck of mission cards (with the new words on them) as well as a matching deck of Hanzi tablet cards. The 30 Age 1 Tablet cards are shuffled and then dealt out to the table in a 6×5 array. The 24 Age 2 Tablet cards are shuffled and set aside for now. Each player is dealt three Age 1 Mission cards, and the rest of the Mission cards form another deck. 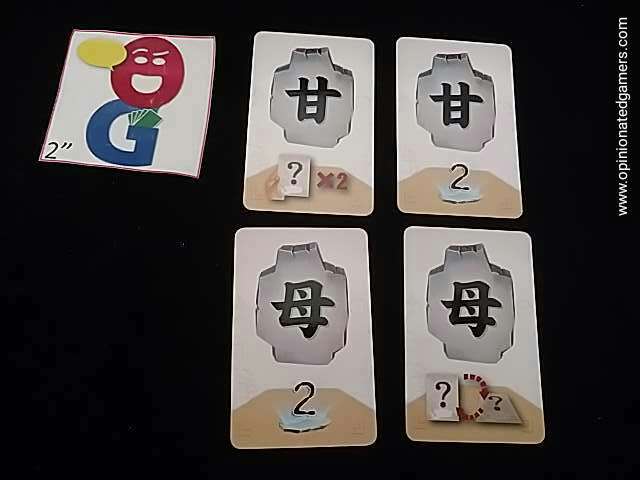 The top three cards of this deck are placed face up on the table to form the Mission card supply. Each player’s Missions are face up on the table so that all players can see this information. A starting player is chosen, and play goes clockwise around the board until one player has ten points. The game ends immediately at that time. On a turn, the active player may first take an optional card action – these come on previously collected tablet cards. Then, the player MUST take a creation action. I’ll describe this creation action first. The active player designates one of his Mission cards in front of him as the target for the round. Then, he flips over any two cards in the 6×5 array. 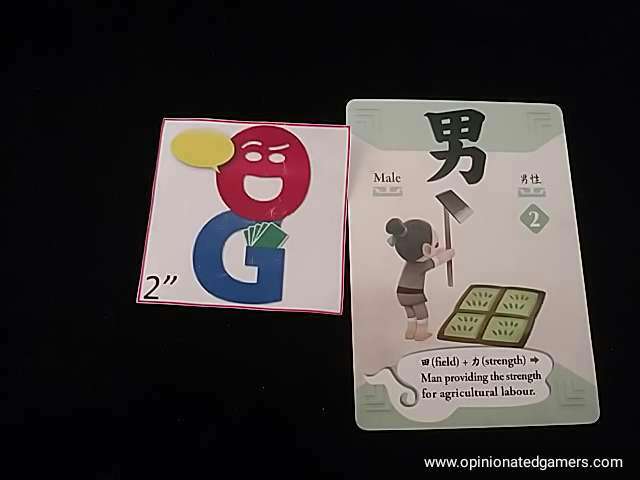 If both cards show the matching symbol to the Mission card, he is successful and collects the two tablet cards. One of the pair of cards will have a “2VP” icon on it – this goes in your scoring pile. The other card of the pair will have a special ability pictured on it. This card goes in your hand and can be played at the start of a later turn as the optional card action. The two empty spaces in the grid are filled in with cards from the tablet deck. Finally, you choose a new mission card from the face up Mission supply, and then once you choose this, you replenish the Mission supply to three cards. If you are unsuccessful in showing the correct match, you show all players the incorrect cards, and then replace them in the same spots where you revealed them. You do get a Creation token from the supply as consolation. You can use these tokens in future creation actions. You can spend one Creation token to allow you to flip three cards on your turn in hopes of getting the two that match your Mission card. You can spend two Creation tokens to exchange one of your face up Mission cards with one from the Mission supply. OK, so back to the optional card actions – they are all special abilities that let you do things such as exchange mission cards with an opponent, draw a random tablet card from someone else’s hand or allow you to perform two creation actions on your turn. The icons are fairly simple to understand, and if not, all the possibilities are easily reviewed in the rulebook. Again, each pair is always worth 2VP, so essentially the game ends as soon as any player has made his fifth correct Mission card match. Well, not every company can hit my sweet spot every time, and as a game, this one is probably on the lower end of the spectrum for me for the EmperorS4 offerings. At it’s core, it’s a simple Memory game, though the Mission cards and the Action card abilities spice it up a little bit. But, only just a little bit. Back to the game – there is more than just simple Memory because you have to designate which pair you’re going for at the start of your turn, so you aren’t rewarded for most lucky flips. In fact, with the special abilities of the cards, there can be a bit of strategy in being able to remember where some matches are so that you can choose the appropriate Mission card from the supply or from another player. Many of the card actions involve targeted actions, so if you don’t like that sort of thing, this won’t be the game for you. Our games pretty much tended to just pick on the current leader, but there’s nothing stopping you from just picking on whoever you like the least. This is not my favorite sort of mechanism, but that’s just personal preference. Now that we’ve learned the derivation of the different characters, I’m not sure that we’re going to pull this one out much more, but it already has likely found a new home at a local high school that offers Mandarin as a foreign language. This will hopefully become an interesting teaching tool for them there.